Birthplace : Leesburg, Tennesse, U.S.
Eliza McCardle Johnson, born October 4, 1810 in Leesburg, Tennessee, United States - died January 15, 1876 in Greeneville, Tennessee, United States was the First lady of the United States as wife of President Andrew Johnson, who served as United States president from 1865 to 1869. Eliza McCardle was the daughter of Sarah Phillips and John McCardle. She was born in Leesburg, Tennessee. Her father was a shoemaker, and briefly managed an inn in Warrensburg, Tennessee. The family eventually moved to Greeneville, Tennessee. After John McCardle's death, Eliza helped her mother who made quilts to support the family. She met Johnson--he was 17; she was 16--as he was traveling to establish a business as a tailor. The consistent lore of their meeting holds that she first spotted him while he was driving a cart. Eliza was reported to have said, "There goes my beau." Johnson biographer Hans L. Trefousse called the tale "probably spurious," but concluded, "there is no question that the two young people soon fell deeply in love." They were married May 17, 1827. A relative of Abraham Lincoln performed the ceremony. Eliza Johnson was considered to have a good basic education. In fact, she was better educated than her husband, having attended Rhea Academy in Greeneville. She taught him to write and perform basic arithmetic and encouraged him to continue in his studies. Her encouragement and housekeeping skills are credited with helping assure Johnson's political success. 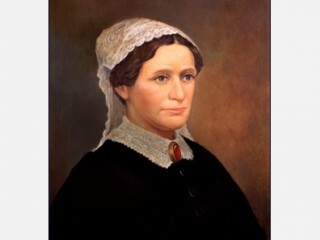 As Andrew Johnson moved from positions in local to state to national government, she was supportive and kept the family and their business affairs running efficiently. The family remained based in Greeneville until Johnson moved into the White House. The couple had five children: Martha, Charles, Mary, Robert, and Andrew, Jr. Each of the Johnson sons met with tragic ends. Charles died in 1863 after being thrown from a horse while an assistant surgeon with the Middle Tennessee Union Infantry. Robert, an alcoholic, served as his father's private secretary; but he died at age 35. Andrew Jr. founded the Greeneville Intelligencer newspaper, which failed within two years; he died soon after the business failed at age 27. With the outbreak of Civil War, President Abraham Lincoln sent Johnson to Nashville in 1862 to act as military governor. Eastern Tennessee's loyalties were with the Union. Eliza and the children were still at home when Confederate forces moved into the area. They were forced to flee their home, and eventually joined Andrew Johnson in Nashville through military lines. Eliza suffered tuberculosis, then known as consumption. Her poor health, apparently aggravated by deprivations during the war, made her an invalid for life. Johnson became vice-president in March 1865. Lincoln was assassinated months later. Eliza was extremely unsettled by Lincoln's assassination and worried when her husband succeeded him. When the Johnsons moved into the White House, they found it in disarray. Souvenir hunters wanting any item associated with the Lincoln presidency had vandalized it. Although she served as a confidante to her husband throughout his political career, she did not appear in public because of her health. She had her daughter, Martha Patterson, stand in for her when social duties required her presence. She saw few people outside the immediate family. Their daughter is remembered as a competent and gracious hostess throughout her father's tenure in the White House. She was even said to have had milk cows grazing on the lawn. Eliza Johnson appeared at White House functions only twice. The first, in 1866, was during a visit by the Hawaiian Queen Emma. The first lady later attended a children's ball in honor of her husband's sixtieth birthday in 1868. The nerve center for the first lady was a second floor room, where her extended family often gathered by her side. The family in the Johnson White House included their two sons; Mary Stover, their widowed daughter, and her children; Senator David T. and Martha Patterson, and their children. Eliza was said to oversee Johnson's daily wardrobe and meals; she also spoke with him almost each night. She surprised him with a new dressing gown from time-to-time. Although her illness kept her confined, she stayed informed both by reading newspapers and through her evening conversations with her husband. She reportedly discussed happier events during evening conversations, saving the less pleasant conversations for the next morning's breakfast discussions. Her staff complemented Eliza for her courteous manners and the respect she showed them. As was the case early in her marriage, she was known as an excellent housekeeper. Johnson was tried for impeachment in 1868. Throughout the three-month-long trial, the first lady provided her husband with moral support. Presidential bodyguard Colonel William H. Crook brought her the news of her husband's acquittal. "Crook, I knew he'd be acquitted; I knew it," Eliza Johnson is said to have responded. At the end of Johnson's term, Eliza returned to the family home, which had between renovated after the war. She looked after the family's real estate investments and the household. Johnson was elected to the Senate in 1875. Continued poor health further restricted her activities. Mrs. Johnson died on January 15, 1876, in the Pattersons' home, about six months after her husband's passing. Few letters between the Johnsons have been found. The bulk of their correspondence was said to have been destroyed, making her, in the words of Hans L. Trefousse (in his book Andrew Johnson: A Biography), "an elusive person, hidden from publicity and thorough historical inquiry." View the full website biography of Eliza Johnson.